Trend Alert: Custom Dog Tag Pendants Are All The Rage! 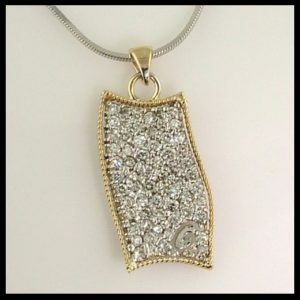 A custom diamond pave dog tag started the trend at Scott’s Custom Jewelers. Over the past year, an interesting jewelry trend has emerged at Scott’s Custom Jewelers in both our Akron and Columbus Ohio jewelry stores – the return of the 60s icon: the dog tag pendant. Maybe it’s a military influence. Certainly, with all of the “conflicts” going on in the world, dog tags are pretty much mainstream now. Or it could be a celebrity thing. Everyone from Jay Z to Jessica Alba has been sporting some sort of tag bling recently. Whatever the reason, these cool, flashy custom pendants are all the rage. It started out with this beauty. Gloria had a really neat diamond pave ring that had a wave shape to it. She didn’t wear it much anymore, but liked the abstract design. So, Scott used his mad jewelry design skills, and our CAD (computer aided design) technology and created this gorgeous diamond pave pendant. The cool part was that the dog tag looked like we simply unraveled the ring and made it into a pendant! We jazzed it up with a 14k yellow gold rope frame and even cut out a “G” on the bottom corner. Because dog tags should be personalized. We showed off this piece on our Facebook page, and soon, another customer came in with an interesting request. She wanted a dog tag…of her dog! Actually, she wanted to make this custom dog tag, representing her four dogs, as an anniversary gift for her husband. Scott scanned a photo of her dog and made an awesome likeness of him, using relief techniques (he’s really, really good – he’s been at it for almost 10 years now!) Then, he added the four birthstones of the dogs they had together over the years. To make the puppy “pop”, he sandblasted the background. A custom diamond dog tag for a bracelet. Sharon had inherited her mother’s wedding rings. She wanted something to wear everyday, but had more than enough rings. We came up with a bracelet idea, with a rounded dog tag on the end. One side contained her mother’s diamond engagement ring, the flip side had the diamonds from her wedding ring. And since Sharon is very fashion forward – we hammered the tag AND sandblasted it. Very nice. For our 26th anniversary, Scott actually surprised me with this custom diamond dog tag. I really didn’t know anything about it, which is HUGE, because I generally know everything going on in both of our location. Scott and Jon, our jeweler, were very sneaky! The six smaller diamonds represent each of our children, and the two larger diamonds are for us. And I absolutely love love love it! He also hammered and sandblasted the dog tag, which makes the diamonds pop. Thank you honey, I love it (and you too, of course)!